Twenty years after it originally played U.S. theaters, Krzysztof Kieslowski’s insanely ambitious Dekalog is back to toss a gasoline-soaked rag onto the constantly raging film versus TV debate. Kieslowski (who died in 1996) was primarily a movie director, best known here for The Double Life Of Véronique and his cosmopolitan Three Colors trilogy (Blue, White, and Red). Back in the late ’80s, however, he and his regular screenwriting partner, Krzysztof Piesiewicz, created a miniseries consisting of 10 hour-long films, each of which riffs on one of the Ten Commandments. The result ranks among the greatest achievements in television history—but it also produced two feature films, expanded from two of the episodes. One of them, A Short Film About Killing, won the Jury Prize at Cannes in 1988, over 18 months before the miniseries first aired. And the whole damn thing has since been released theatrically in various countries. (Its current limited engagement in the U.S. precedes a forthcoming Criterion release.) So, is this masterwork film or TV or some line-straddling combination? Answer: When it’s this terrific, who really cares? That’s not to say that all 10 films are equally great. Dekalog works best as a cumulative experience, even though its stories are almost completely unrelated—they all take place in the same dingy Warsaw apartment complex, and characters from one film occasionally cameo in another film (never in a significant capacity), but that’s the extent of the connections. Kieslowski and Piesiewicz didn’t even bother to name the episodes, which are identified solely by number: One, Two, Three, etc. That only reinforces the sense that they function as a series of moral investigations, intended to be assessed as a group. In some cases, it’s easy to tell which commandment is being examined, regardless of whether you can recall the order (which varies denominationally anyway); “Thou shalt not kill,” “Thou shalt not steal,” and “Thou shalt not commit adultery” are all abundantly clear. Other cases, like the film that ostensibly illustrates “Thou shalt not take the name of the Lord thy God in vain,” requires more in the way of creative interpretation. Crucially, all of them work fine even for those who may be ignorant of the conceptual structure. 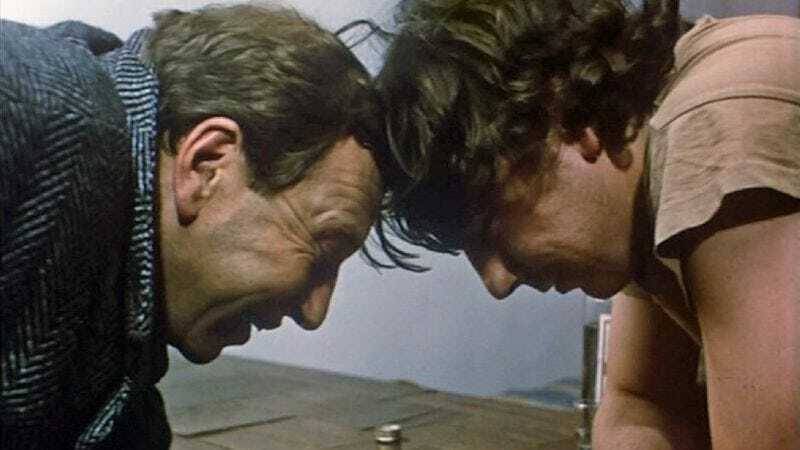 Take Dekalog One, for example—it’s neither the best or the worst of the bunch, but it’s perhaps the most representative. A university professor named Krzysztof (Henryk Baranowski) encourages the scientific and mathematical interests of his 12-year-old son, Pawel (Wojciech Klata), showing him how to solve equations on the family’s home computer (a comparatively rare possession back in the ’80s). At the same time, Dad, who’s pretty clearly an atheist, doesn’t object when his sister (Maja Komorowska) wants to discuss matters of faith with her nephew, and assents without hesitation when his curious son signs up for religion classes. (Mom is working somewhere abroad, one gathers from bits and pieces of information.) The crux of the narrative arrives when Pawel, who knows he’s getting ice skates for Christmas, seeks to determine, via wholly objective data, whether the ice covering the lake near their house will support his weight. One doesn’t need to know that the first commandment forbids placing other Gods in front of Yahweh/Jehovah/Big Man in order to grapple with the meaning of what follows. Nor is said meaning even remotely clear-cut, given the additional, non-digital steps that Krzysztof takes to ensure his son’s safety. Just as everyone’s personal ranking of, say, the Coen brothers’ movies will be wildly different, so will everyone’s opinion regarding which Dekalog films are the standouts. Not a single one is bad, though, and some quick poking around suggests that just about everybody considers at least four or five of them superb, even if folks don’t always agree on which four or five. Dekalog Six, about a young man who becomes voyeuristically obsessed with an older neighbor and inspires her obsession with him in turn, ranks among the greatest studies of toxic romance ever made. (The feature-length expansion, A Short Film About Love, is also terrific, but has a radically different and much weaker ending.) Dekalog Five juxtaposes a truly brutal murder and the murderer’s subsequent execution, to equally nauseating effect. The most tender is Dekalog Three, in which a woman corrals a married ex-lover into helping her find her missing husband on Christmas Eve; the most disturbing and thought-provoking is Dekalog Four, centered around a letter written by a dying mother that’s discovered by her adult daughter two decades later. The series even concludes with a (jet-black) comedy, as if to counterbalance the general intensity. Oh, there’s one other connecting thread. All but two of the 10 films feature a silent young man (Artur Barcís) who appears in different guises—student, hospital orderly, homeless dude—and just stares balefully in the direction of that film’s protagonist, almost always at some decisive moment. This device risks coming across as a bit precious, but it provides a welcome sense of mystery to some of the more straightforward entries (notably Dekalog Eight and Dekalog Nine) and strengthens the feeling of continuity. (Even though the 10 films employ nine different cinematographers, they share the same utilitarian look; only the two shot by the great Piotr Sobocinski, who’d be Oscar-nominated a few years later for his work on Red, stand out visually.) Truly, Dekalog is a single grand entity, greater than the sum of its sometimes stupendous parts. Think of it as the televisual and/or cinematic equivalent of Joyce’s Dubliners, providing a monumental, probing yet playful snapshot of Warsaw in the late 1980s. Then hunker down and burrow in. Purchasing Dekalog via Amazon helps support The A.V. Club.